Foremost Nigerian poet and novelist, Gabriel Imomotimi Okara is dead. Okara reportedly died on Monday at his residence in Yenagoa, the Bayelsa State Capital. The renowned poet was born 24 April, 1921. He died four weeks to his 98th year birthday. He became famous following his publication of his art work, The Voice in 1964. 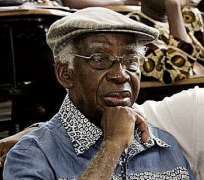 The deceased, born at Bumoundi in Yenagoa, was the first Modernist poet of Anglophone Africa. Sources told WARRI TODAY that he died after a brief illness. No official statement has been released either by his immediate family or the Bayelsa State Government on the development at the time of filing this report.